Web Basics—You need to know this. 1. Your Domain Name Registrar (DNR) is the company where you lease your domain name (you don’t really buy it), e.g., GoDaddy is a DNR. 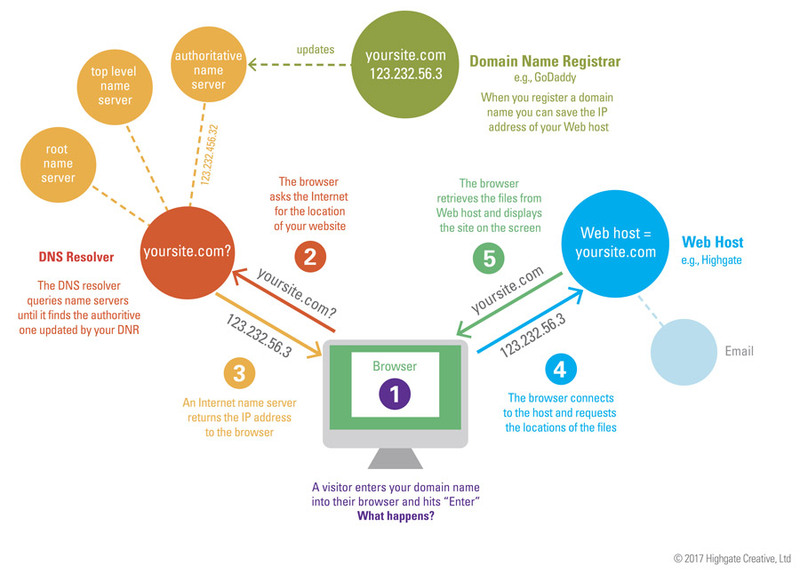 All your DNR officially does is a) maintain your domain name account and b) keep a record of where your web host is (where your website resides). 2. Your website is hosted by a completely different company. Your DNR, e.g,, GoDaddy, has nothing to do with this other than to maintain a record of who your Web host is (which will become clear in a minute). Note: a Web host is basically just a a bunch of computers with hard drives that store your files and helps browsers find them so they can display them for people coming to your website. 3. Your website is built using a piece of software called a CMS or “content management system.” There is a good chance that if we are building your site we are using WordPress, originally just blogging software but now used for websites. You use the CMS to update/maintain/edit your content (pages, words, forms, and pictures) on your website. The CMS, and all your files, reside at your Web host. When someone types your domain name into their browser, the browser goes to your DNR (GoDaddy) and asks where your website is. GoDaddy tells the browser who your Web host is, e.g., Host Gator. Then the browser goes to Host Gator and asks for the files. Host Gator gives the location on their hard drive of where to find the files, and then your browser downloads them and displays them. All in a nanosecond (thank you Sir Timothy Berners-Lee). Of course, it's loads more complicated than that, but so is everything, right? But this should suffice to make you a hit at your next cocktail party. Click here to read an even more technical explanation of your website.